Today, Tuesday, January 22, 2019, on the anniversary of Roe v. Wade,the NYS Assembly and Senate passed the Reproductive Health Act sending it to Governor Andrew Cuomo to sign into law. AND HE DID! 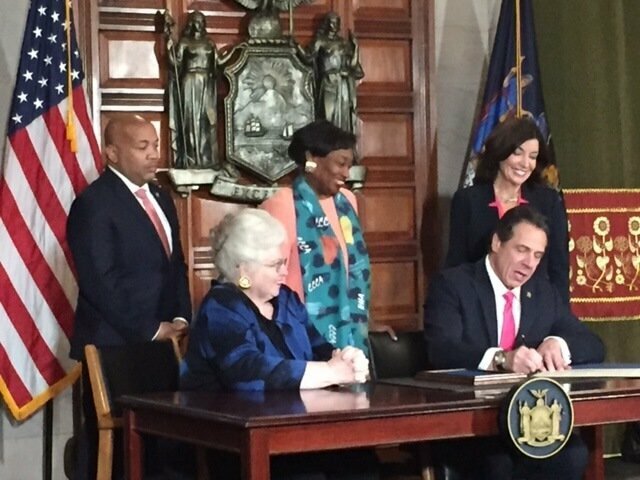 New York – as of today – finally has legislation that takes abortion out of the penal code, that means no longer legislating abortion as homicide, and instead providing women with 21st century medical reproductive health care. This could not have happened without YOU! Choice Matters has been working tirelessly to pass this bill since 2006. 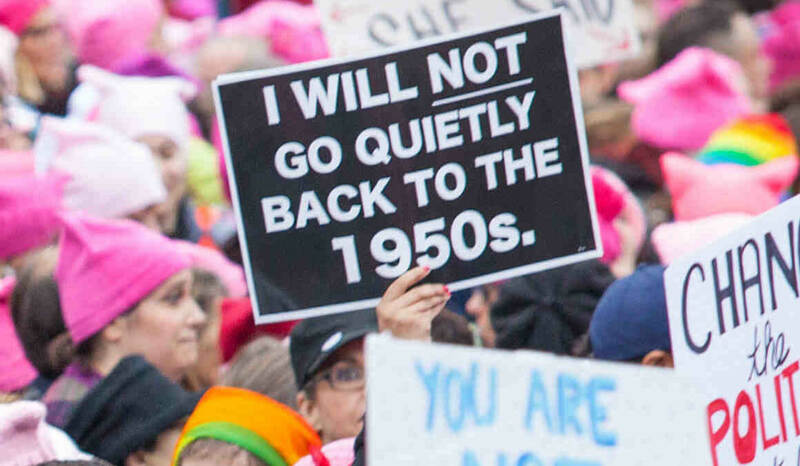 However, not until you voted in 2018 to give NYS a pro-choice Senate with a Democratic majority could we make this pro-woman healthcare, pro-woman’s civil rights law a reality. We thank you for your support and ask you to recognize that we work day in and day out to pass pro-choice legislation to protect your right to Choose. Now we will focus our attention on making sure that NYS has a budget that enables women who live on the financial borderline to actually be able to use this law! January 22, 2019 / In Uncategorized / Tags: abortion, new york state, reproductive health act, rha / By catherine / Comments Off on It’s official – the Reproductive Health Act is Law! We, the undersigned, ask that you vote for the Reproductive Health Act (RHA) of 2019 during this legislative session. The RHA secures and protects our health and reproductive rights by updating New York’s outdated abortion law passed back in 1970, prior to Roe v. Wade. According to current state law, New York regulates abortion as a homicide in the penal code. The law as it stands fails to meet the constitutional standard of Roe and is out of step with modern medicine. With the Trump administration determined to limit abortion access and a new anti-Roe majority on the Supreme Court, time is of the utmost importance. This is why we ask that you pass the RHA NOW. Updates our laws, securing and protecting the right to abortion in New York. The RHA enshrines in state law the constitutional standard of Roe, affirms reproductive freedoms, and allows New Yorkers to get safe and legal abortions. Protects health care professionals who provide vital care. The RHA ensures that qualified health care providers with appropriate training and expertise can provide abortion services. This improves access to health care, especially for low income women, women of color and women in rural areas. Treats abortion as health care, not a crime. The RHA moves the regulation of abortion from the penal code into public health law and repeals a Civil War-era law that criminalizes women who terminate a pregnancy without a medical provider. Nearly eight out of 10 New Yorkers support protecting a woman’s right to have an abortion. Additionally, one in four women will access abortion care in their lifetime. We want to make sure that New York offers the fullest protections when it comes to reproductive health care. The policies of the Trump administration and the new Supreme Court make it unsafe and irresponsible for New York to rely on federal protections to ensure our basic rights. ​We need state protections, and we expect our elected officials to show real leadership in defending abortion access. With your support, New York State can be a national leader when it comes to abortion access and the reproductive rights of women. We strongly urge members of both houses of the legislature to support the Reproductive Health Act of 2019. WCLA – Choice Matters, the oldest ongoing pro-choice advocacy organization in the nation, proudly joins with the following forty (40) New York State-based organizations, together representing thousands upon thousands of NYS residents, to ask NYS Governor Cuomo, the NYS Senate and the NYS Assembly to pass the Reproductive Health Act into law NOW. Where Will Our Women Go? Reproductive freedom in the United States has been under siege for years. Since November, state governments have been passing abortion restrictions at a record speed. Every new regulation passed further limits what was once a recognized Constitutional right â€“ the right for every woman to be able to have a safe, legal abortion. Ironically, these regulations â€“ which according toÂ Roe v. WadeÂ are unconstitutional â€“ are being passed in the name of protecting the health and safety of women.Â In reality they are endangering women by forcing them to return to back alley abortions â€“ all at a time when Trump has promised to overturnÂ Roe. Earlier this month the Center for Reproductive Rights filed a law suit in the Louisiana District Court challenging the onerous regulations that serve only to impede access to abortion care. Louisiana could be Any State, USA. Only one year ago, the US Supreme Court affirmed that a similar Texas abortion restriction was unconstitutional because the burdens imposed on abortion access outweighed the so-called benefits conferred by such action. Under the guise of â€œhealth and safety,â€ Louisiana is again trying to pass a version of the Texas T.R.A.P. law, but now we have a new anti-choice Supreme Court Justice. T.R.A.P., Targeted Regulation of Abortion Providers, is exactly that. These bills target abortion providers with a series of arduous requirements that affect every aspect of the medical care being provided. The restrictions are issue-specific: they are only being applied to abortion providers, not to any other low-risk healthcare providers. Abortion providers and their facilities are already subject to the Stateâ€™s medical licensing laws so these bills are further unwarranted. These new regulations are not structured to make the medical procedure safer. The sole goal is to close clinics, thereby making safe and legal abortion access impossible. AsÂ Whole Womanâ€™s HealthÂ (2016) clarified, states may not infringe on Americansâ€™ constitutional right to abortion by subjecting it to sham medical regulations and by pressuring abortion facilities to close. Louisiana is not the only State crafting this type of deceptive legislation. It is happening across the country, in every state. The threat to abortion access is real and only proliferating. Under this administration and with a new Supreme Court justice changing the balance of the Court, no previous decision is safe. We need a state thatÂ is committedÂ to being a reproductive rights sanctuaryÂ â€“ a safe zone where any woman can safely, swiftly and legally terminate her pregnancy. You might believe we, New York, are already that State, but we have only become less friendly to reproductive rights as time has passed.Â Our abortion law is arcane, and still in the penal code. It was passed in 1970 and has never been updated to include 21stÂ century medical care or the full constitutional protection guaranteed byÂ Roe.Â 53% of NYÂ counties have no abortion clinics. If a woman’s health is at risk or something goes wrong in her pregnancy after 24 weeks, she must seek care outside of NY because State law doesn’t allow a doctor to provide abortion coverage. Where will she go when RoeÂ is overturned?Â We need New York State to be a leader again. To accomplish that, we must pass the Reproductive Health Act. Butâ€¦we have a serious roadblock. There is a group called the IDC (Independent Democratic Caucus).Â They obstruct all progressive legislation from coming to the floor of the Senate for a vote because they have chosen to leave the Democratic Caucus and, instead, govern with the Party of Trump. They took the electorates decision to elect a Democratic Majority away from the voters! For personal gain, they instead joined forces with the Republicans, and are blocking the Comprehensive Contraceptive Coverage Act and the Reproductive Health Act from coming to the floor of the Senate for a vote. Letâ€™s make NY the progressive state it once was.Â Letâ€™s protect the reproductive rights for all women. Tell them: You can’t have it both ways! NYS Senators & IDC leading members Klein, Savino & CarlucciÂ claimÂ to be pro-choice BUT refuse to sign on as co-sponsors of the Reproductive Health Act*. Just like you can’t be “a little bit pregnant”, you can’t be “a little bit pro-choice”. You cannot pick & choose civil rights.Â It’s all or nothing. These 3 IDC traitors want women to vote for them, so they lie. *They say, “We’re Pro-choice.”Â BUTÂ they do not supportÂ women having 21st century medical care. *They do not support giving New York women the full constitutional protect guaranteed by Roe v. Wade. *They do not supportÂ putting abortion careÂ in the health code. *They support keeping abortionÂ in the penal code. Because of them, if Astorino, or his equivalent, becomes governor, it will be easyÂ toÂ “tweek” the law and, potentially, end up prosecuting women and their doctors. Call Klein, Savino & Carlucci and Demand They sign on as Co-Sponsors of the Reproductive Health Act! A Constitutional Amendment? Not with the IDC! Governor CuomoÂ has proposedÂ a New York State constitutional amendment codifyingÂ Roe v. WadeÂ in State law. Why? Because passing a constitutional amendment into law is a very lengthy process. Â **Each house of government, the Senate and the Assembly, must pass the legislationÂ twiceÂ â€“ one time in two different elected sessions; **Then, and only then, the proposed amendment can be put on the ballot for a public vote. But hereâ€™s the reality and the truth.Â This constitutional amendment will NEVER make it to the floor whileÂ theÂ 8 rogue DemocratsÂ of the Independent Democratic Conference (IDC) remain aligned with the Republican Party of Trump and govern with them. The IDC has deliberately turned the duly elected Majority Party, the Democratic Party, into the Minority Party, and have catapulted the Party of Trump, the Republican Party, into the majority. Because of these 8, our New York State Senate has failed to do the business of the People for which they were elected.Â In a nutshell, these 8,Â whoÂ are more concerned with personal power than party andÂ principle, sold out their constituents and Â including and specifically the women of New York State. Given Trumpâ€™s nomination ofÂ Judge Neil M.Â Gorsuch, the original author of the Hobby Lobby decision, to the Supreme Court, we need Governor Cuomo to demand these 8 rogue Democrats return to the Democratic Caucus. There is no time to waste!Â Trump is doing everything in his power to turn the clock back on women. If these 8 â€œDemocratsâ€ did their jobs and put women first, hereâ€™s how we could get this done immediately: NY State Senate Minority Leader, Senator Andrea Stewart-Cousins, rightfully be the Majority Leader, has sponsored a law — the Reproductive Health Act — that would do immediately what the Governor is proposing toÂ take years to do. The Senate would then go on to make the Comprehensive Contraceptive Coverage Act (CCCA) law, and pass a budge that would provide for Planned Parenthood and neighborhood clinics. Make the Comprehensive Contraceptive Coverage Act law! Alert: Tell Gov Cuomo, Now is the Time to Stand Strong for Women’s Health! Pro-Choice Activist, Your action is needed! The national dialogue about women’s health has become an outright war against women. Despite this horrific onslaughtâ€”from Congress to state legislatures to the GOP presidential candidatesâ€”New Yorkers have felt protected by the belief that Governor Cuomo would stand with us and help pass the Reproductive Health Act. The Reproductive Health Act is our best hope for strengthening New Yorkâ€™s protections for womenâ€™s health care and turning the anti-woman tide that is sweeping the country. With the Governorâ€™s support, we have a real chance to pass it this year! Without it we donâ€™t. But we must act quickly. Make Your Voice Heard – Email the Governor a Message! This week the national attack on women’s health has come to New York. The state’s Catholic Conference has descended on Albany in strong opposition to this crucial legislation. Anti-choice legislators have maneuvered to stall the bill in committee. But they don’t speak for the vast majority of New Yorkers who want to secure and strengthen reproductive freedom.Â Three-quarters of allÂ New YorkersÂ and 70% of all Catholics support the passage of Â the Reproductive Health Act. It would explicitly recognize a womanâ€™s right to reproductive-health care, including abortion and contraception. It would also fix a troubling gap in current law that fails to protect a womanâ€™s access to care when her health is endangered later in pregnancy. That’s why the governor needs to hear from you. Let Governor Cuomo know that you’re another New Yorker for the Reproductive Health Act.